For months I have had a surge protector, plus several USB chargers plugged into the nightstand by my bed. I really only need a couple of electrical outlets, and often have as many as 5 USB devices plugged in at one time. 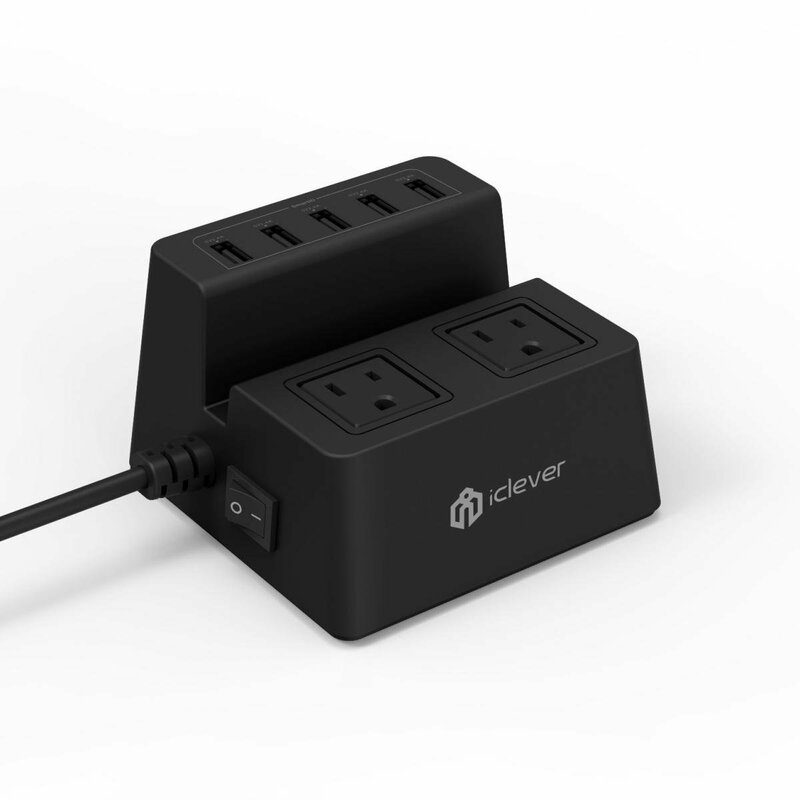 This iClever BoostCube Multiple Ports Desktop Charger, 5-Port USB (SmartID 40W 8A) Charging Station with 1700J 2 Surge Protected Outlets Power Strip for iPhone iPad Samsung Smartphone Tablet Laptop is the perfect solution to my problem. It has exactly what I need. The two surge protected outlets are exactly enough for my electrical needs, and there are 5 USB ports as well. My bedside lamp takes a USB charger, so this leaves the other 4 USB ports for my smart phone, my camera, my tablet and one other device of my choice. Depending on the day it could be another phone, my selfie stick, a power bank, my headphones, or anything else in need of a charge. This charger not only takes up less space on my nightstand, but is also attractive looking. It is sturdy and the four pads on the bottom of this multi-port charger protect my stand from scratches. I love that it has a built in surge protector because we have had a ridiculous amount of power outages lately, and this will help to protect my electronics from damage caused by power surges. I also love the 5 foot power cable which enables me to plug this device in behind the bed and out of the way. This assures that I won't be accidentally knocking the charger from the stand. Using this device also clears up much of the cord clutter from before. I can easily keep multiple items close at hand and they can all be plugged into one charger, rather than having multiple cords, with multiple chargers attached to multiple devices scattered across my nightstand every night. I love this multi-port charger, and would recommend it to anyone who has multiple USB devices.